Love this. Hectic, and cozy. I love this sort of painting and I am sad it is no longer in style. If a painting tells a story-so much the better. Hi, Yvette - I know the format isn't correct, but it reminds me of a Saturday Evening Post cover. Mark, I think this was probably a magazine illustration but I couldn't find any info on which one. Gannam (1907 -1965) was a popular and very busy illustrator. 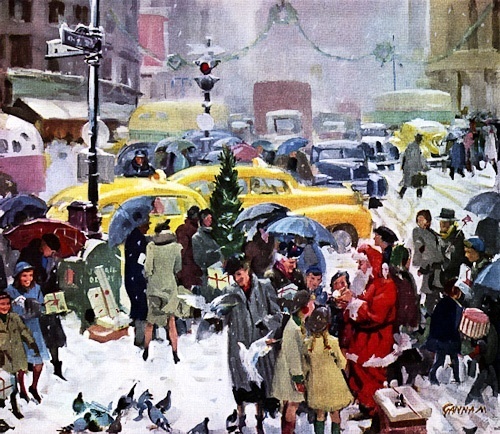 I have this glorified idea of Christmas in NYC, paintings like this only confirm it. Ryan, I glorify Christmas in New York because really, it was - is - very special. The city which is magical to begin with, becomes even more magical. I love the vintage illustrators and their interpretations.